Like a lot of artists after years of school and school projects you tend to get yourself in a rut. It’s like you forget how to create visual works without someone telling you the parameters of the assignment. You might ask yourself “You mean I have to come up with something all on my own?” I was in one of those ruts. 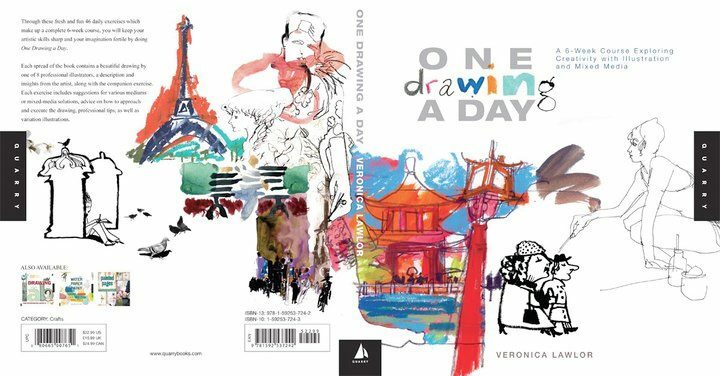 So I went to my local library and perused the Arts and Crafts section and grabbed this book: One Drawing A Day: A 6-Week Course Exploring Creativity with Illustration and Mixed Media by Veronica Lawlor. It sat on my shelf for a few months. I even renewed it several times before opening it up. I felt that is might be worth reading. I was on the lookout for something to do artistically and here it was. Over the next 6 weeks I will be creating over 42+ drawings using different mediums (Pen, ink, pencil, watercolors, mixed media, etc…). I will take notes to see what and how I can incorporate any of this into some of my lesson plans for teaching. I am excited to start sketching again. This entry was posted in Artists, My Work, Teachers Resources and tagged arts and crafts, Drawing, Lesson Plans, My Work, One Drawing a Day, school projects, Sketches. Bookmark the permalink.